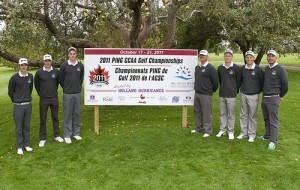 The UFV Cascades men’s golf team finished third at the 2011 CCAA national golf championships in Charlottetown, PEI. The Cascades finished the two-day event with a team score of 613, 26 strokes behind the two-time champion Humber College Hawks (Ontario). The host Holland College Hurricanes (Maritimes) finished second with a score of 609. The Cascades have earned a CCAA national golf medal in four of the past five national championships. “We came back strong today. Won bronze! I am very proud of our guys, they played well today,” said head coach Chris Bertram.